This week’s foray into Postcard Friendship Friday brings us to this gift from my postcard friend Eddy, who runs the excellent blog D’hier à aujourd’hui (From Yesterday to Today), which compares postcard images of the France of yesteryear with modern views of the same sites. 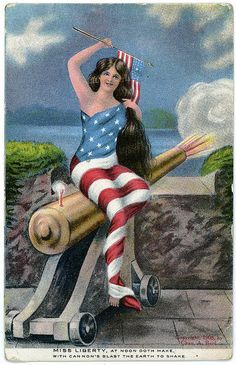 This card, along with another turn-of-the-century French card, arrived a few days ago, but you get to see only this one today; I will save the other for Bastille Day. This postcard, postmarked 24 August 1905, shows the top of the Fontaine Carpeaux in Paris’s 6th District. The four maidens, created by sculptor Jean Baptiste Carpeaux, represent the “four parts of the world”: an African; an American Indian; an Asian; and a Caucasian. They are posed as if they are turning the celestial sphere, complete with the signs of the zodiac, around the Earth. Interestingly, the sphere was not created by Carpeaux, but by another sculptor, Pierre Legrain. The fountain’s pool, not pictured, contains sculptures of horses emerging from the water, which were created by yet another sculptor, Emmanuel Frémiet. But it is only Carpeaux’s name on the fountain. All my regrets at not being here yesterday to thank you for your strong support. I charge this card with the deed and will meet both of you for dinner tomorrow night Friday without fail. I embrace you (both). Yvette. I guess the modern equivalent is receiving an email that closes with the word “hugs.” There’s also a postscript in the upper left: “Alice wants(?) me to hug you for her.” Let us hope that Yvette kept her appointment, gave hugs all around, and didn’t have to send another apology. Wonderful card! There is a story to be told here – what ever could have delayed Yvette! what else, the translation of the postcard back is very good. And how much time for researches concerning the realization of the fountain. Have you lived in Paris ? Did you know that “E V” at the bottom of the adress means “En Ville” (In Town). Nowadays it can’t be used anymore, we use 5 numbers postal code. I was wondering about the “E V”; in the States, one used to be able to write “City” to accomplish the same thing. I have not been to Paris, but my French lessons included information about France in addition to the French language. I made an ever so slight “correction” to your comment over at Layhoon’s place. Muscular ladies, don’t you think? :) But I suppose they would have to be, with the weight of the world on their shoulders. 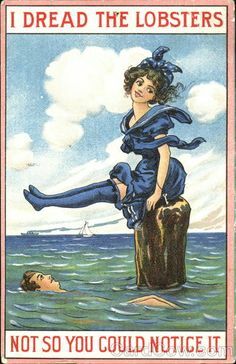 That problem of translating French kissing is perennial as can be seen here. love the handwriting! computers destroyed people’s ability to write artistically. hehe. Beautiful handwriting on yet another antique card. I’ve been thinking that I need to take a handwriting class. My chicken scratched postcards won’t impress anyone in the future. The translation needs a correction. “… pour vous remercier de vive voix” does NOT mean “for your strong support,” but “[to thank you] in person.” Literally, “de vive voix” (like “viva voce” in Italian” means “with a live voice” as opposed to “in writing.” Thanks for the great carte postale! My high school French is showing. Thanks, Renée!